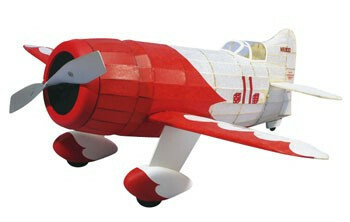 Dumas Gee Bee R-1 Racer 24"
DUM403 Dumas Gee Bee R-1 Racer 24"
Great for all ages! These kits make great projects to learn about building and flying model airplanes. Beginners will be astonished by their ease of construction, while experienced modelers will appreciate the quality materials and the precision laser cut parts. Sheet of RED tissue 20" x 30"
Sheet of WHITE tissue 20" x 30"
Wooden Dowl 1/8" x 4"